Is it real or perceived? Anxiety is the body’s natural response to danger and acts as a protective alarm for threatening situations. It can help us to stay alert and motivate us to protective action that may at times be necessary. A certain level of stress and anxiety is a necessary part of life. It is part of what motivates us to progress in life, create things, earn a living and keep us safe. It is when it becomes overwhelming and constant that it can be harmful to our well being, our health as well as our quality of life. Even small every day stresses can wear us down when experienced regularly and constantly. If feelings of anxiety are occurring frequently, are overwhelming, and may interfere with your responsibilities it may be that an anxiety disorder has developed. Experience irritability and restlessness regularly? Have moments where you feel your mind is going blank? Often experience uncontrollable fears that you know are irrational? Experience sudden or unexpected panic? Avoid certain daily situations because of fear or anxiety? Have regular feelings of tension? 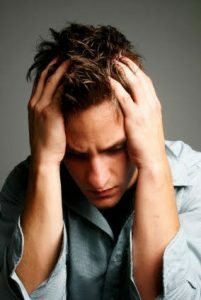 Anxiety attacks are moments of intense panic or fear. They may occur unexpectedly or triggered by a certain experience. They may occur at any time, whilst shopping, driving the car or at home cooking. They may last for a few minutes or up to an hour. During that time they may be so intense that there is a feeling of losing control. Often the fear of the anxiety attack may add to the severity of the experience. Hypnosis is often used to alleviate levels of distress and anxiety. During a deep state of relaxation, certain therapeutic techniques can be applied to review reasons for anxiety and reduce their intensity.